EnviroPig - an environmental blessing or disaster? The EnviroPig, a kind of Yorkshire pig, is a genetically engineered "frankenswine" that has been created to be greener than your average piggy and his poop. 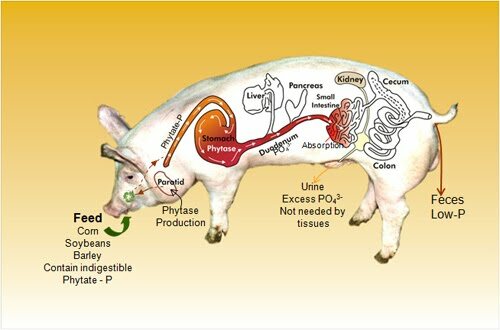 Since feedlot pigs have issues digesting the phosphorus they get from their feed, they end up excreting it in their poop and urine, resulting in that factory pig farm stench. This strange brew manure is then used as a fertilizer on the farms. Which means that, when it rains, all this phosphorus runs off into waterways and, in the case, of the Mississippi, out into the Gulf, creating a giant dead zone from the resulting algal blooms. This is an enormous problem for streams, rivers and lakes downstream from factory pig farms. In some cases, it's an environmental catastrophe. Enter genetic engineering. Scientists have replaced one gene to help the pig break down the phosphorus. Creators of the EnviroPig achieved this by splicing a gene from the E. coli bacteria and a bit of mouse DNA into a normal pig embryo. This new and improved pig's poop contains 30 - 60% less phosphorous. An environmental blessing? Well, this transgenic pig isn't quite ready to enter the food chain and end up on your plate just yet, but it could be soon enough. It is supposed to taste the same as a regular Yorkshire pig, even with its minor modifications. I'm not sure exactly how they're testing its safety for human consumption, but I can't say I'll be lining up to try it. Although with the lack of GMO labeling in this country, thousands of people could end up eating it without their knowledge. surprised if that changed. Testing so far claims that it's equivalent in nutritional value (fats, proteins and the like) to unmodified pigs. But, is that testing enough? We've seen similar modifications turn out badly, namely with allergic reactions to GMO corn. Indications from other GMO products point to previously unknown health impacts, particularly in feedlot animals. Like sterility and organ failure. Now, don't get me wrong, I don't mind genetic selection to produce improved kinds of animals, vegetables and minerals, but when you start mixing and matching bacteria and multiple mammal DNA well, I get a little nervous about the outcome. But, mostly, I think we are just approaching the problem from the wrong direction. Rather than modify the pig, why don't we modify the management of pig poop? And, while we are at it, maybe monitor factory pig farming a little bit better? And finally, there's the obvious aspect of maybe eating less meat altogether so we'd have less pig poop to dispose of. Would you willingly eat an EnviroPig? More importantly, what do you feel about GMO labelling? So many issues here- but basically I think they boil down - ethically speaking - to this: do you believe in harm reduction? In other words, is incremental change that allows the basic harmful premise to continue a step forward, or not? Injection sites are a step forward for heroin addicts. I guess. Frying pan into the fire, for sure. I don't want to eat an Enviropig and I don't want an Epig sharing this world. It doesn't seem like the Epig would go the way of the gm-farm-fish but if it did that could mean the end of the porkchop, and as an omnivore, that would make me sad. I agree that a GMO pig with greener poop is NOT the way to go. Responsible farming is the issue. I find it ridiculous that the pork industry would pay, I'm sure, a huge premium for GMO piglets and sows but could probably do much more for the environment by changing their farming methods or even reducing the number of pigs they have. I can't see those types of changes being more costly than creating a new frankenpig, but what do I know. Of course, I'm sure it's all about increasing profits. Why do we even have the FDA and USDA and EPA anymore? Seems like they are either bought out by industry or if not, industry buys out congress, who cuts their funding. Either way, we the people lose. Wow, this is truly scary! I do not want to eat genetically modified pigs or any other GMOs. At this point I feel as if the American Consumer is just a lab rat in a huge, unregulated experiment. There is just no way to know what effect this type of genetic tinkering will have on our bodies. It isn't right that we should have to be afraid of our food supply!! I couldn't agree more! And besides, it's not only phosphorus contributing to ocean dead zones but nitrogen as well. What a ridiculous and unethical 'solution'. It's depessing to see how much money and effort is spent to make up new tricks to reduce our environmental negative impact without decreasing our sacred consumerism... It could have been spent to teach people to eat less meat for example, or to get better manure treatment in the pig farms, but no, it has been chosen to create a new pig. It would be funny if it wasn't sad, don't you think ? We will not be eating this. And the reason that Big Ag and GMO Corp will push EnviroFrankenPig over better poop management, is that no one will get paid patent royalties on better poop management, no matter how much better (and safer) a solution that is.